In our previous Android Forensics tutorial, we have learned about basic directory structure of android need for Android Forensics tutorial. In continuation of our chain of Android Forensics tutorial, today we will learn more about Android File System, how it can be helpful in Android Forensics. Having basic understanding for file systems is really helpful for basic any disk or OS forensics. Well for your information, android supports multiple file systems. But if we consider smartphones, then a very common terminology used is “YAFFS2 (Yet another Flash File System). It’s the main partition of Android file system and it’s specifically designed for embedded systems such as Smartphones, tablets etc. 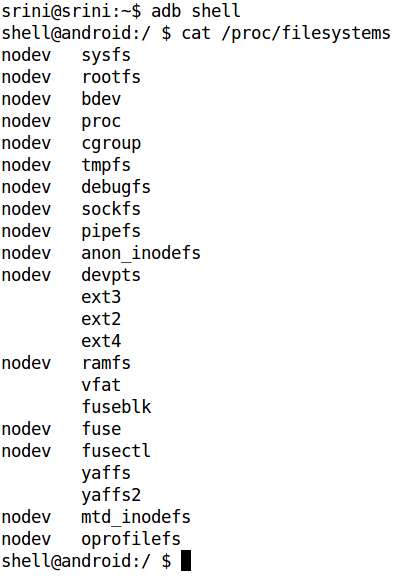 The “nodev” entry next to the file system indicates that there is no physical device associated with that particular file system. Android supports ext2, ext3, and ext4 file systems (used by Linux systems) and the vfat file system used by Windows-based systems. Since it is targeted for mobile devices, Android supports YAFFS and YAFFS2 file systems, since it requires supporting NAND chips used in these devices. If we observe the above figure, there are few important file system partitions such as /system, /cache, /data using ext4 as their file system type rather than YAFFS. This is because, starting from Gingerbread, Android has replaced YAFFS file system with ext4. That’s all for today friends ! If you have any doubts feel free to ask. We will learn more about Android Forensics in future articles. Keep Learning!! Keep Connected! !